This year, in honor of trying to keep our Superbowl party kind of healthy... I am bringing this dip to be my saving grace. It does have cream cheese... and I refused to use the low fat kind... so that is my splurge. I made this about a week ago for my sister-in-laws baby shower and it seemed to be quite a hit so it definitely warrants another test group and I think the ladies will love the lightness of this flavorful dish. I received the inspiration to make this dish on pinterest from Our Best Bites and the website I found it at has a GREAT photo tutorial that you can view here. I only made a few variations of her original and think anything you might want to add or remove will still make a wonderful dip. Spread the cream cheese on top of a serving platter. (I tend to use a circle platter and spread the cream cheese to make an inner circle on the platter, leaving room for pita chips to be placed on the sides of the dip.) Refrigerate for a half an hour. Drop the hummus by small spoonfuls evenly over the top of the cream cheese. Spread as evenly as possible. 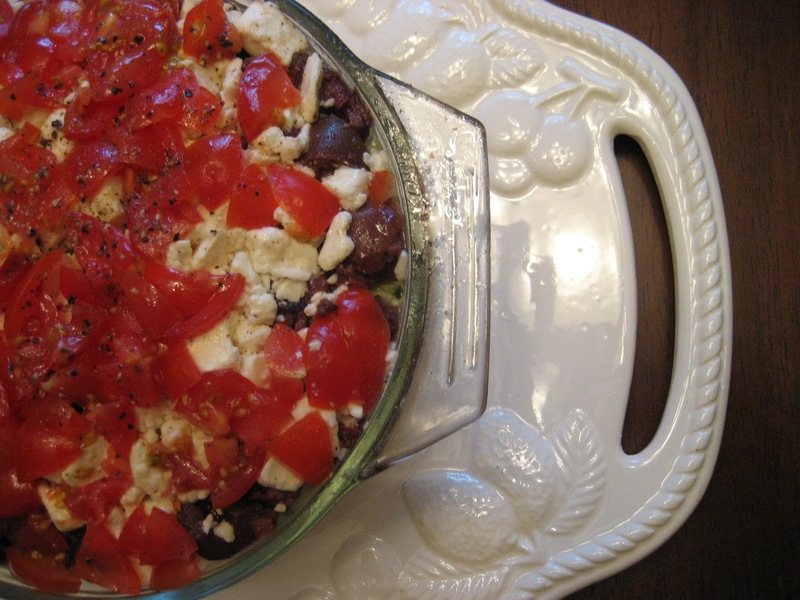 Top with the remaining ingredients in layers in the following order: cucumber, tomatoes, olives, feta, green onions, and a tiny drizzle of olive oil.